This week Sterg and Derek discuss three fascinating and genre-spanning titles. They begin with Lisa Hanawalt’s Coyote Doggirl (Drawn and Quarterly). As the guys point out, this is a humor-infused story that engages with the western genre. Both Derek and Sterg mention that while they appreciate Hanawalt’s off-beat sense of humor, they haven’t been big fans of her past books, in that they weren’t so much narrative comics as they were illustrated works of humor. But Coyote Doggirl is more of a “traditional” comic, with sequential panels and a discernible storyline. The premise is more or less simple, but that’s part of the charm of this text. And the humor! Next, the Two Guys with PhDs turn to Emi Gennis’s Baseline Blvd., released earlier this year from Kilgore Books and Comics. This actually began as a webcomic back in 2015, but it was published in hardcopy as part of Kilgore’s Kickstarter campaign for their 2018 releases. Where many of Gennis’s comics have been profiles or biographies, this latest book is more autobiographical in nature. As the guys point out, there is a silent elegance about this work, and Gennis packs a lot of story — and emotion — into her brief narrative. 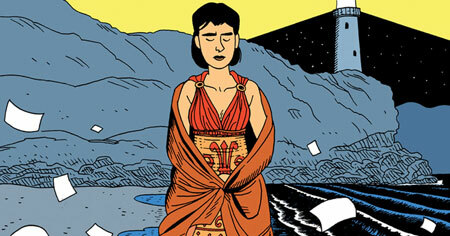 The guys then wrap up the episode by looking at Warren Ellis and Jason Howard’s Cemetery Beach #1 (Image Comics). Sterg observes that this seems to be a typical Ellis narrative — and “typical” in a good, demonstrative way — and both of the guys comment on Howard’s art. In fact, much of this first issue is carried by the illustrations. In all, it’s a successful first issue. This seven-issue sci-fi series has a lot of promise, and both Derek and Sterg look forward to seeing where the creators take their premise. Jason Lutes began his Berlin series in the spring of 1996, with plans to publish his ambitious project over a 24-issue run. Over the years, he pared down the number of issues to 22, and the last of those was released in March of this year. Earlier this month, Drawn and Quarterly released a complete single-volume edition of Berlin, clocking in at over 550 pages, as well as a third volume of the series, City of Light, for those who had already gotten the previous two collections, City of Stones and City of Smoke, and didn’t want to get the completed series in just one volume. Berlin is a massive narrative with an ensemble cast. It takes place in that volatile city during the last days of the Weimar Republic, 1928-1933, when Germany was struggling with its economy and war reparations, and a variety of political factions — in particular, the Communist Party and the National Socialist Workers Party — were vying for power. Lutes’s story primarily focuses on the lives of Kurt Severing, a world-weary journalist, and Marthe Müller, an uncertain art student moving to Berlin and longing to define herself in this newly adopted city. But there are a variety of other characters, as well, and Lutes even peppers his fictional cast with several historically based figures, including the jailed journalist Carl von Ossietzky, Joseph Goebbels, Josephine Baker, and, yes, Adolf Hitler himself. The result is an expansive narrative that not only captures the Weimar culture at the time, but also explores individual desires and unpredictable relationships in the midst of political and economic upheaval. In his interview with him, Derek talks with Jason about the origins of the series, the amount of research that went into the project, how the city of Berlin became a point of inspiration, the various challenges he faced maintaining such an ongoing series for over 20 years, and where Jason’s artistic ambitions may take him next. Twenty years after the first collection of Hicksville was released, creator Dylan Horrocks talks to Emmet about how the comic looks to him now. Some of the work’s commentary on the comics industry turned out to presage subsequent developments, and in some cases he ended up not going far enough! Also, his source for a Jack Kirby quote that many experts were unaware of; the public’s misinterpretation of the term “graphic novel”; the explosion of female and minority comics creators, especially outside of the Big Two; and more. Zach Worton was last on the podcast about two years ago, around the time of the publication of the second volume in his Charley Butters series, The Search for Charley Butters. On that interview show, Zach discussed the development of his storyline and what to expect in the third and final volume of the series, The Death of Charley Butters. As fate would have it, Zach and his publisher, Conundrum Press, decided to hold off on publishing the third stand-alone installment, and instead, put out the entire series in one complete volume. The result is The Curse of Charley Butters, just released last month, and including the first two Charley Butter stories and what would have been the third. In fact, this complete collection reads as a tight, cohesive narrative, and getting all of the Charley Butters installments in one nice volume is definitely the way to read this story. In this interview Derek talks with Zach about the genesis of his project, the challenges involved in its serialization, the stark nature of the storytelling, and the experience of taking his protagonist down an ever-darkening downward spiral. Zach also discusses his other new work, The Weird World of Lagoola Gardner, a magazine-sized comic whose tone is completely different from Charley Butters, looser, more comedic, and reminiscent of the kind of free-wheeling garage band- and tiki-influenced publications of the late 1960s. This week Paul and Derek discuss Anna Haifisch’s Von Spatz (Drawn and Quarterly), Joe Henderson and Lee Garbett’s Skyward #1 (Image Comics), and Peter Hogan and Steve Parkhouse’s Resident Alien: An Alien in New York #1 (Dark Horse Comics). Gene and Derek are excited to have John Porcellino back on the podcast. His new book From Lone Mountain has just been released by Drawn and Quarterly, and John talks in depth about the time in his life covered in this collection, as well as the process of pulling all of these experiences together. The book collects King-Cat Comics & Stories #62-#68, released between 2003-2007. The Two Guys ask John about the evolution of his compositional strategies, the role that place and landscape play in his comics, how both prose and illustrations function for self-exploration, his thoughts on punk and the DIY aesthetic, and how his comics serve as a release for, as well as a reflection of, the many changes in his life. This isn’t the first time John P. has been on The Comics Alternative — he came on for an interview around the release of issue #76 of King-Cat Comics & Stories — and the guys certainly hope that this isn’t his last visit. And be sure to check out John’s online store, Spit and a Half. There you can find not only his King-Cat Comics & Stories, but also a variety of other mini- and indie comics by other creators, as well! Shea and Derek are back with their February manga episode. This month they look at two titles that, in many ways, are diametrically opposite in terms of style and audience. They begin with Seiichi Hayashi’s Red Colored Elegy, the softcover edition of which has just been released from Drawn and Quarterly. This is the story of two young artists cohabiting and the struggles they endure with their families, they work, and their relationship with one another. But there’s much more going on in this narrative, as the guys abundantly point out. This is an experimental work that was originally serialized in Garo during the early 1970s, and Hayashi’s variations in visual style, along with his employment of nonconventional storytelling techniques, are what make this such an intriguing and significant work. After that, Shea and Derek discuss the first volume of Kaiu Shirai and Posuka Demizu’s The Promised Neverland (VIZ Media). It’s a fantastical, and even futuristic, series about a community of orphans who learn that their comfortable life is undergirded by demonic forces. Both of the guys appreciate Demizu’s art, and they’re intrigued by the series’ premise. At the same time, they wonder about some of the choices the creators made toward the end of this first volume, especially regarding narrative focalization. But they’re both interested in seeing how things develop and if, indeed, Shirai’s storytelling choices turn out to be effective as the plot unfolds. VIZ Media released the second volume of the series earlier this month, but the guys weren’t able to get copies of that text in time for this recording (despite reaching out several times to the publisher’s publicity department). 00:003:11 – We get significant listener responses! This week Gene and Derek discuss, yet again, three diverse titles. They begin with Anneli Furmark’s Red Winter (Drawn and Quarterly). It’s the the first in a trilogy of graphic novels, although this is Furmark’s first work translated into English. The narrative is set in the late 1970s and centers on two lovers struggling with complicating relationships, both marital and political. Each chapter focuses on a particular character involved in the drama, and Furmark’s presentation is both contemplative and tonally provocative. The guys eagerly await further Furmark translations coming from Drawn and Quarterly. Next, the Two Guys check out the first issue of a new Vertigo Comics miniseries, Motherlands, written by Si Spurrier and with art by Rachel Stott. This is a sci-fi, futuristic story of a middle-age multi-dimensional bounty hunter, Tabitha Tubach, trying to earn a living, while at the same time struggling with her past and a mother who marked it (and not for the better). And as if familial matters couldn’t get more any more trying, the end of this inaugural issue brings additional complications with the emergence of Tabitha’s sibling, Bubbsa. On the January manga episode, Shea and Derek discuss the first five volumes in Drawn and Quarterly’s Kitaro series, created by Shigeru Mizuki. This includes The Birth of Kitaro, Kitaro Meets Nurarihyon, Kitaro and the Great Tanuki War, Kitaro’s Strange Adventures, and the most recent Kitaro the Vampire Slayer. Both guys love this character, and they have a good time highlighting the usual, and at times wacky, characters that populate Mizuki’s yokai narratives. Hair that shoots out projectiles? Walking eyeballs? Farts that destroy? Poisonous pee? Yep…this is the world of Kitaro. After that, Shea and Derek take a completely different turn with Paul Gravett’s Mangasia: The Definitive Guide to Asian Comics (Thames and Hudson). This is a visually infused overview of manga from across Asia, not just that in Japan. Gravett’s encyclopedic knowledge of Asian comics is unparalleled. And although Shea would have wanted a more critical text, the book’s graphic-centric approach serves as a indispensable introduction to the medium. On this interview episode, Derek talks with R. Sikoryak about his latest work, The Unquotable Trump, just released this week by Drawn and Quarterly. The conversation begins with Bob’s apologies for having to write the book and his distaste for the subject matter. But as he makes clear in the interview, these cartoons are his way of dealing with what he feels is a malignant force unleashed by last year’s election. In fact, Bob reveals that the genesis of The Unquotable Trump actually dates from the days before the election, when he was using the figure of Donald Trump — and more importantly, the candidate’s own words — in classic comic-book cover parodies as a way of trying to vent his anger. These black-and-white illustrations originally appeared in a minicomic released back in January, but his publisher, Drawn and Quarterly, convinced him to create more parodic illustrations and release them in a 48-page color volume, oversized in the style of a 1970s Marvel Treasury Edition. Each page of The Unquotable Trump displays a parody of a classic comic-book cover with the figure of Trump inserted, spouting off comments that the real-life candidate-turned-president actually made. Among the many stylistic allusions Bob makes are to such legends as Jack Kirby, Wally Wood, Bob Montana, Jerry Robinson, Carl Barks, John Romita, Gil Kane, and C.C. Beck. In fact, Sikoryak documents all of his comics references in the back of the text, along with a bibliography of Trump’s actual quotes. But although most of the interview is devoted to the new book, Derek also talks with Bob about other topics, such as Terms and Conditions, the complete colorized volume of what had originally been published as the two-issue mini-comic, The Unabridged Graphic Adaptation of iTunes Terms and Conditions (originally reviewed on The Comics Alternative a couple of years ago), his ongoing work mashing up comics and classic literature, and the genesis of his parodying impulses, reaching back to his days working with Art Spiegelman on Raw. The monthly manga series is back, and on this episode — the first of two manga shows in October — Shea and Derek discuss a couple of very different works. 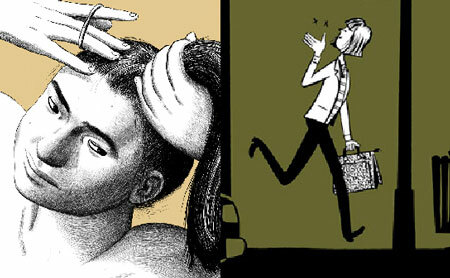 They begin with Yeon-Sik Hong’s Uncomfortably Happily (Drawn and Quarterly). This is the story of Hong and his wife becoming frustrated with living in crowded and polluted Seoul, ultimately deciding to move to a house in a remote mountain community. As the guys reveal, the majority of the narrative is devoted to the everyday challenges the couple undergo, the quotidian tasks involved in living in such a raw, isolated area. Over the course of their conversation Derek and Shea address the question of autobiography: Is this indeed a memoir of what Hong and his wife actually underwent? Neither of the guys doubts that the story is anchored in Hong’s real-life experiences, although Derek makes the argument that the construction of the narrative bears more of a fictional stamp than one of life writing. Next the guys turn to a very different kind of manga. Iou Kuroda’s Appleseed Alpha (Kodansha Comics) is a manga based on Shirow Masamune’s original Appleseed, as well as an adaptation of Shinji Aramaki’s anime feature. Both Shea and Derek are impressed with Kuroda’s art, dynamic and drenched in heavy inks, but they’re not as excited about the coherency of the story. There are gaps in the narrative, the various events aren’t necessarily linked cohesively, and the overall story can be a bit confusing at times. Nonetheless, the guys, especially Shea, are taken by Kuroda’s efforts. Shea appreciates this follow-up to the Shirow’s Appleseed, which he has read, and Derek feels impelled now to seek out the original manga series. At the end of month, Shea and Derek will be back with their second October manga show, a special Halloween show devoted to horror manga. Keep your ears open! This week a wide-ranging discussion between two Canadians about comics in Canada. The talk centers on Montreal-based publisher Drawn & Quarterly, and two books from their catalog: Michel Rabagliati’s 2005 book Paul Moves Out, and the latest from Jillian Tamaki, Boundless. Also, some deep background on the history and people behind Toronto comics shop The Beguiling. 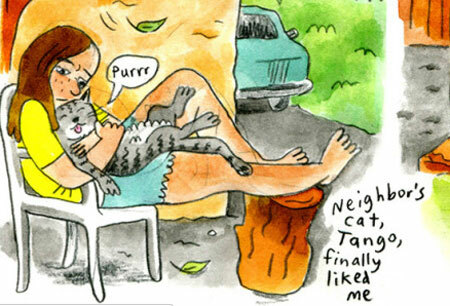 Vanessa Davis is an L.A.-based creator of autobio comics Spaniel Rage, Make Me A Woman and Out of Time. Koom has been an admirer of her work, and this week he talks with her in depth about whether she sees herself as part of a “movement”; the pitfalls of reporting in your comics on what your family members do (like that time with her mom in the museum…); how her parents affected the direction of her art; and much more.